Water Buffalo Teeth from Chichester, Inc. These water buffalo teeth were taken from domesticated water buffalo. They have been cleaned and come either drilled or undrilled. They are ideal for craft projects or for making pendants. They can be stained in tea to make them look old fashioned. 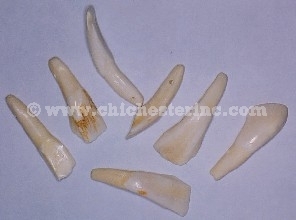 The teeth are approximately 1.5 - 1.75" (3.75 - 4.4 cm) long and 1/2" to 5/8" (1.25 - 1.5 cm) wide. Domesticated water buffalo are not endangered. The teeth come from animals that were slaughtered for meat.